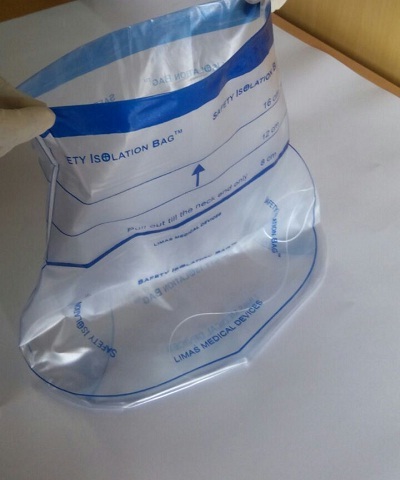 The present innovation relates to “Safety Isolation Bag”, a pneumoperitoneum device for intra-abdominal, endoscopic procedures, power morcellation and vaginal morcellation for facilitating safe removal of body mass from within the abdominal cavity. It comprises of an expandable and collapsible enclosed internal space having a neck portion with mouth having re-tractor means and provided with markings, color coded indicating how much the bag is to be pulled out for the removal of large, medium and small tissue mass, and also having one or more non-return valves attached with long looped threads on one of the surface in the wall of the safety isolation bag below the neck as a means for introducing the surgical instruments and accessories into the enclosed internal space at the right place and to close the puncture hole after the procedure. It is made of one or more layers of flexible biocompatible / medical grade plastic film. The present invention relates to a Lime Stone (Calcium Carbonate)and Navasar (Ammonium Chloride) Based Multi-Purpose Composition. The invention disclosed in this application relates to a novel biodegradable additive polymer composition useful for the preparation of biodegradable plastic products which comprises of a mixture of (i) a polymer selected from Polyethylene, polypropylene, poly styrene, poly vinyl chloride or a mixture thereof (ii) Cellulose ( iii) Amides ( iv) nutrients selected from Blue green algae and / or Yeast and (v) Water. This composition can be mixed with a virgin polymer to get a master polymer. The master batch composition may be mixed with a virgin polymer, which is useful for preparing products which are biodegradable. The invention relates to a process for recovery of useful constituents from multilayer laminated fragments arising as waste from industrial packaging manufacture. It relates more particularly to recovery of polyethylene plastic and aluminium foil from multilayered, laminated fragments containing these materials. According to the process disclosed, the delamination of the laminated constituents of the packaging waste fragments is carried out by keeping the fragments immersed in nitric acid of 50 - 70 % concentration at ambient temperature for 3 to 6 hour duration. The aluminium foils get fully separated from the plastics and the constituents remain in a submerged/floating condition. The delaminated constituents are removed from the nitric acid bath and allowed to pass through a series of baths for washing and separation of the materials. The fragments of separated aluminium foils and separated plastic are centrifuged to dryness and then allowed a sun bath for total drying. The separated fragments of aluminium foils can be used for producing aluminium ingots or sold as such. Similarly the separated fragments of plastic can be used for producing recycled plastic granules or sold as such. Click here for complete project presentation. Fixed Dose Combination of two antibiotics: cefepime hydrochloride (a cephalosporin) and amikacin sulphate (an aminoglycoside) administered as a single product. The product is developed to overcome multi bacterial, complicated hospital acquired ICU infections particularly in deadly diseases like Nosocomial Pneumonia and Febrile Neutropenia. Copyright © 2007-2019 IIPRD. All rights reserved.